President Jefferson's choice to lead an expedition was Meriwether Lewis, his former secretary and a fellow native of Albemarle County, Virginia. Having reached the rank of captain in the U.S. Army, Lewis possessed military discipline and experience that would prove invaluable. While in the Army, Lewis had served in a rifle company commanded by William Clark. It was Clark whom Lewis chose to assist him in leading this U.S. Army expedition, commonly known today as the "Corps of Discovery." On February 28, 1803, Congress appropriated funds for the Expedition, and Jefferson's dream came closer to becoming a reality. It was important for Lewis to gain certain scientific skills and to buy equipment that would be needed on the journey. In the spring of 1803, Lewis traveled to Philadelphia to study with the leading scientists of the day. Andrew Ellicott taught Lewis map making and surveying. Benjamin Smith Barton tutored Lewis in botany, Robert Patterson in mathematics, Caspar Wistar in anatomy and fossils, and Benjamin Rush in medicine. During this time, he also twice visited the arsenal at Harpers Ferry to obtain rifles and other supplies that he had shipped to Pittsburgh, Pennsylvania, where he was to recruit men and make last-minute purchases before setting off on the Ohio River to meet Clark. While in Philadelphia Lewis purchased many of the items required for the journey. 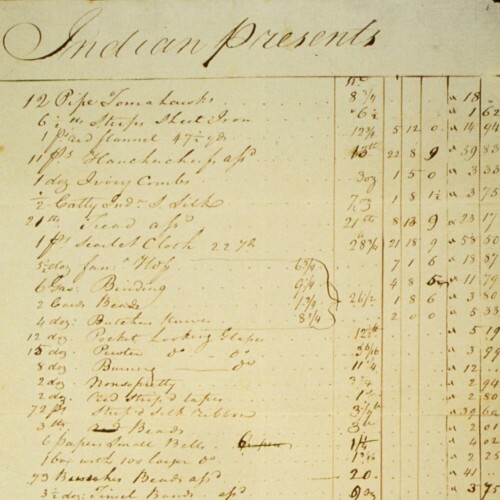 His shopping list included scientific instruments such as a chronometer and a sextant, an air rifle, arms and ammunition, medicines, ink and other materials for journal keeping, and a large array of other items, including 193 pounds of portable soup, a corn mill, mosquito netting, blankets, oiled linen for making tents, candles, tools, and reference books. Lewis also purchased gifts for Native Americans. It was well known that in Indian cultures gift exchange was an important sign of friendship and allegiance. To prepare for this, he bought glass beads, mirrors, scissors, thimbles, needles, tobacco, knives, and peace medals. Through the exchange of gifts, and following Jefferson's instructions to treat the Indians "in the most friendly and conciliatory manner," it was hoped that knowledge of them could be acquired and trade increased. A look at the long-time relationship between the Jefferson and Lewis families and Jefferson's reasons for choosing Meriwether Lewis to command the Expedition. Jefferson and Lewis often dealt with sensitive information and looked to methods to keep their messages secret. 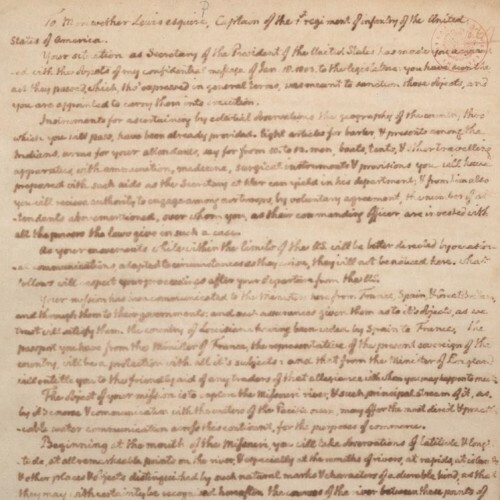 A transcription of Jefferson's letter to Lewis outlining all the tasks he should accomplish on the journey.